The red admiral (Vanessa atalanta) is a colorful, medium-sized buttefly with a wingspan of 1.75-2.25 inches (4.4-5.7 cm). It is a brush-foot butterfly belonging to the family Nymphalidae. 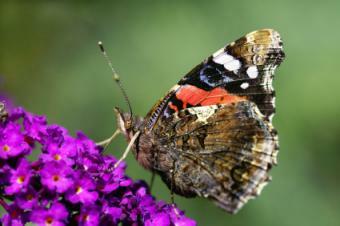 Adult red admiral butterflies feed mainly on flower nectar. They especially enjoy the flowers of the butterfly bush, but will feed on many different types of flowers. They will also feed on overripe or rotting fruit. Red admirals have a wide range. They are found throughout North and Central America, as well as in Hawaii and in some parts of Europe. Female red admirals lay green eggs singly on the leaves of a host plant. In colder climates they usually produce two broods per season. In warmer climates they reproduce all year long. The host plant for red admiral caterpillars are stinging nettles (Urtica dioica), although they sometimes feed on other species of the nettle family (Urticaceae) and sometimes on hops (Humulus sp.). Red admiral caterpillars are somewhat light in color when they first hatch, but become darker as they get older and are more fully developed. They are also covered in black bristles. The red admiral chrysalis is brownish-gray in color. 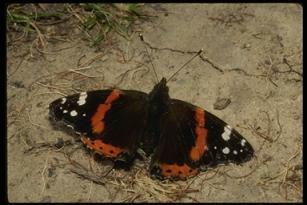 To learn more about the red admiral butterfly please visit https://vanessa.ent.iastate.edu/some-basic-information-four-vanessa-butterfly-species-north-america. The red admiral butterfly is not on the U.S. Fish and Wildlife Service threatened or endangered species list.